Having 400sqm at their disposal, it was only obvious for these Quezon City residents to want a home that had free-flowing spaces. They commissioned architect Roland Andres to design a home that was not only spacious but allowed many natural elements like light and greenery to flow through. The result is an open and airy sanctuary that the couple can find refuge in after long days in the city. Beautiful greenery, like foxtail ferns and lotus, surrounds the property of this urban tropical paradise. Zen stepping stones mark the path towards the wooden double doors –opening up to the serene escape inside. 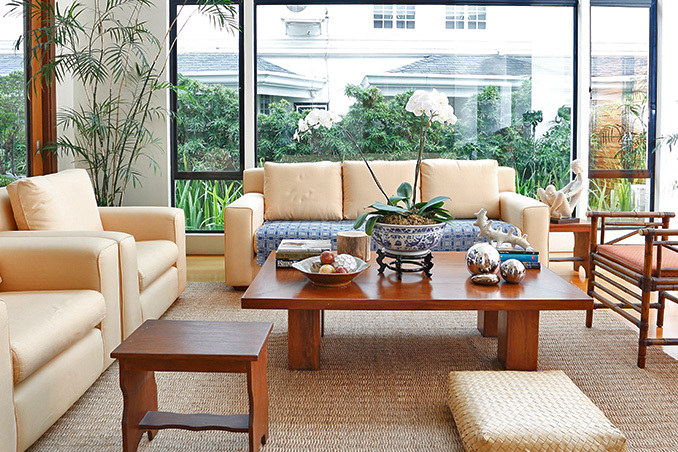 Large windows flood the living area with calming natural light, immediately alleviating negativity. Finally, a neutral color scheme creates an inviting and cozy atmosphere anyone would want to come home to. Despite it being in a busy city, there is no need to step out the door to find a peaceful place for relaxation and serenity. Original article by Katherine Lopez. Styling by Dagny Madamba. Pictorial Direction by Nat M. Clave. Photographed by Ocs Alvarez/ Acme Visual Productions. Read the original article ("Open Up") in the November 2013 issue of Real Living Magazine. Download your digital copy of Real Living on the Real Living App (https://itunes.apple.com/us/app/real-living/id553158056?mt=8) now! Log on to summitnewsstand.com.ph/real-living for more details.